Heather Mekkelson, "Planet Thirteen," 2013, wood, enamel, wax, tempera powder, metallic powder, brass nails. A sense of play pervades Chicago-based artist Heather Mekkelson’s work in “Now Slices.” Her combinations of objects and materials - part sculptural object, part installation - are centered around a preoccupation for outer space, a relatively recent development in this artist’s practice. Prior to this exhibition, Mekkelson was known for work that drew from the aesthetics of natural disaster aftermath, particularly that of hurricanes. This earlier work is markedly solemn and emotionally weighty, littered with piles of cracked dishes, dirty clothes, and jumbled, ruined construction material. And while the artist has (at least for the time being) moved away from this kind of topical, literal content, her knowledge and mastery of material translates effectively into her new subject matter. Whereas Mekkelson’s disaster works employed materials for their literal associations, in “Now Slices” the materials are transformed. In pieces like “Planet Thirteen,” combinations of media create miniature landscapes, the material no longer solely imparting its intended use and meaning, but now also contributing to the representation and illusion of brand new imagery. The layering of tempera powder and metallic powder in “Planet Thirteen” becomes a moonscape. The fine, delicate surface of the powders appear undisturbed, like a deserted landscape in an atmosphere-less environment. 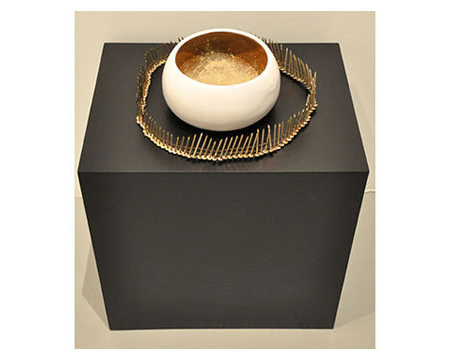 The powder landscape has been created inside a bowl surrounded by a circle of collated brass nails on a black painted pedestal, the concentric rings reinforcing the celestial nature of her formal decisions. Likewise, the styrofoam, pyrite and glass of Mekkelson’s “Light Escape and Entrapment” are at once ordinary and otherworldly. Set atop a pile of square, styrofoam boards is a cluster of glass crystals, pieces of brass and a lustrous nugget of pyrite, capturing and refracting the gallery light and illuminating the monochrome surface of the foam platform. In “Event Horizon,” humble material - MDF, burlap and vinyl - are elegant in their combination, the burlap encased in vinyl except where a nebulous cut out portion exposes a lacquered under layer, surrounded by the slightest edging of the natural burlap fibers. Mekkelson’s “Now Slices” work is sleeker and less gritty than much of her earlier practice. Creation, rather than destruction, is at the forefront. However, one of the most distinctive qualities of Mekkelson’s recent work is the manner in which she creates representational subject matter while simultaneously abstracting it. In her previous works, it was evident that the artist’s research and first-hand encounters with disasters informed the literal representation of her content, but here, her abstraction activates the viewer’s imagination in a way that is perfectly fitting to this branch of science that only a select few ever get to truly experience.